This is the final concert of the first half of the TSO’s season, and so nice to see them once again in our National Concert Hall. Word on the street is that there’s going to be a new hall for them in the near future, which excites me, except for the fact that it is a much farther drive from my house. In any case, the programs have just been released for the concerts for this second half of the season, in 2016, and while some don’t interest me, there are definitely some gems to look forward to. Tonight on the program was Haydn’s fourth symphony. First on the program tonight was Maestro Varga’s ever-present pre-concert speech, a feature I have come to love. This time, we’re in the National Concert Hall, which means speaking and playing before a much larger audience, at least twice as large (if sold out, and if my memory of seating capacities serves me correctly). Translator for tonight was the principal cellist, a very competent but very nervous translator. Varga started from the end: the Bartok piece. It is, he said, far less played than another of Bartok’s famous suites, The Magnificent Mandarin, which he described as being extremely “violent,” and noting that The Wooden Prince is, in contrast, a fairy tale, opening with the most delicate of sunsets. Next was to introduce Ernő Dohnányi’s Konzertstuck for violin, a piece neither he nor the orchestra had ever performed before. (I spoke extremely briefly with Hoffman about it after the program, but more on that later.) It is, needless to say, an underperformed piece. I myself have only heard the composer’s first piano concerto and first symphony. Then, he introduced Haydn, the man on the program who needs the least introduction, but it indeed is a work of his that is rarely performed, at least in contrast with the symphonies numbered above, say, 50 or 70. He drew special attention to the second violins, which, he added, is “a stupid name; they are just ‘the other violins. '” Starting with “you love ghosts in this country,” he stated that the second violins play a stunning “ghost melody” in the second movement. The concert got underway and we began Haydn 4. There’s something about seeing a piece live, not even on YouTube, but actually live. There’s no cameraman telling you what or who to watch; just take it all in. We’ve discussed Haydn’s fourth before, but it’s still new and exciting and far more interesting to see it live. It’s a short piece, mind you, in three movements, with the minuet as the finale, but it was played with passion, poise, and delicacy, a delightful piece for the greatest outsider in this Hungarian-themed evening. By far the smallest piece on the program, it was almost an amuse bouche for what came next. I have to say, there were moments of Dohnányi’s piece that were truly captivating, really interesting textures, lyrical sections, prominent oboe and clarinet solos, and of course Hoffman’s playing was effortlessly virtuosic, but I feel like it’s a piece I need to give three or four more passes at before I really get it. There were clearly separate sections that served similar functions to the movements of a standard concerto, but it ended quietly and heavenly(-ly?). For the first time I’ve ever seen, the soloist sat on the right of the conductor. Also, if you’re not familiar with Gary Hoffman, read this article, wonderfully entitled The Unbearable Lightness of Being Gary Hoffman, even if I haven’t seen the work the title is referencing. He did indeed shuffle and shift and fidget with his things. The piano bench on which he sat made a creaking sound when he moved, and he shifted left and right a few times as if to demonstrate, catching the attention of Varga, to whom he gave a shrug. The audience chuckled and the piece began. It was obvious only later why he (maybe) sat on that side. In one of the most memorable moments of the entire work, the soloist is joined by his brethren the cello section when they all play a gorgeous melody in unison, like a long lost husband finally united with his family, relishing the moment. It was gorgeous. That is the only reason I can figure for the placement. It was a charming work, but one I feel I need to give a few more tries at if I’m to get it. Hoffman gave an encore, the sarabande to Bach’s third cello suite. I’d have loved to hear them all. More on that later. Next on the program was what was to be the absolute gem of the evening, by far. I saw The Royal Philharmonic perform The Magnificent Mandarin under Charles Dutoit a few years ago (before the blog; even sat front row) and I wish I’d appreciated it more. In any case, tonight’s performance by the Taipei Symphony of Bartok’s Wooden Prince suite was nothing short of magnificent. Five stars, eight thumbs up, smiley face sticker, whatever your currency is for ‘perfect score’, the TSO earned it this evening. By the way, if I haven’t said before, all of these programs tonight were firsts for the orchestra, and the first two for Varga. The Bartok suite reminded me in some ways of Stravinsky’s ballet suites. Maybe that’s an unfair comparison because it’s a very Bartok work, but I think the association fits for anyone not familiar with the kind of piece this is. As Varga said, it does indeed begin pristinely, but, as you would expect if you’ve heard anything of Bartok’s, it does show off a bit of its crazy here and there. For one, enormous orchestra. The Dohnányi called for what I’d describe as an early romantic piece: winds in pairs, no trombones, only timpani for percussion, maybe a slightly larger than typical compliment of strings, but modest. 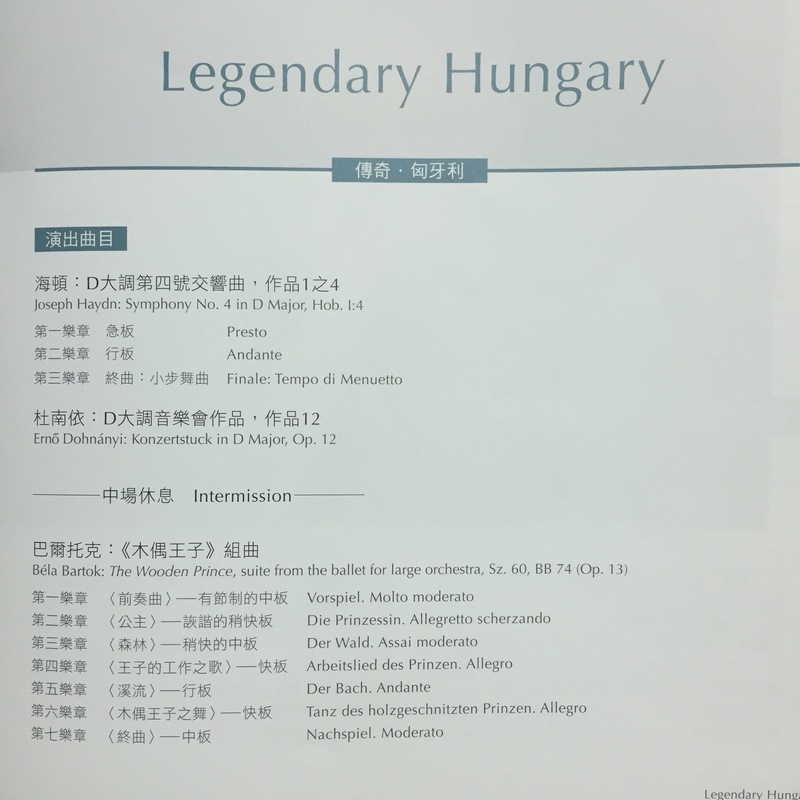 Bartok, on the other hand was enormous: at least three of each wind instrument, two contrabassoons, two harps, saxophones, a small army of percussion, tuba (only one of them; sorry), so it was a good thing we were in our concert hall and not 中山堂. I’m not sure they’d fit. In any case, the piece does its Bartok-esque thing: rhythms and clicks and tricky meter changes and all of the rest, and it was one of the most ‘wheels have fallen off’ moments of perfect crazy I’ve heard in a concert. It was pristinely executed, calculated chaos, performed with brazen confidence, virtuosity, and cleanness. It went right to the cliff’s edge of all hell breaking loose, and then came back. A truly fantastic performance. A truly top-notch performance, reminding me again how fortunate we are to have Varga and the TSO with us. The evening did not end without a plea for support and a reminder to patrons to call out to the city for a concert hall of their own. And then an autograph signing, of course. I’ve gotten Varga’s autograph about a dozen times, but that’s not really what I’m after. It’s more just to say a quick hello, shake his hand, and thank him for an exquisite concert, no matter which one it is. This time, though, I’d prepared a single question for each of the autograph-givers. To Varga, I asked “When will we be getting another opera?” Eugene Onegin was spectacular, and I said to him quietly, as if to answer my own question, “Wozzeck!” He responded practically, stating that the opera house is under renovation over the summer, and they can’t get it in the fall, so it’s “something smaller,” what exactly, he refused to say, but it seems they had something in mind. Pelleas et Melisande? I don’t know. I can’t remember how he phrased it, but he reached his hand to his chest and grabbed at his soul. It seems he would have gone on chatting about it for another half-hour, which I’d have enjoyed, but there was a whole cascading line of people waiting for their autographs. What a nice man, and an incredible performer. It’s bittersweet to leave the hall, I thought. Won’t be seeing them for about another two months or more, but it was very much a treat to hear everything on the concert program this evening. If only the TSO had such a hall with every performance. One day, Taipei, one day.